Author: M. Crasnier-Mednansky, Ph.D., D.Sc. Copyright © 2005 Mednansky Institute, Inc. 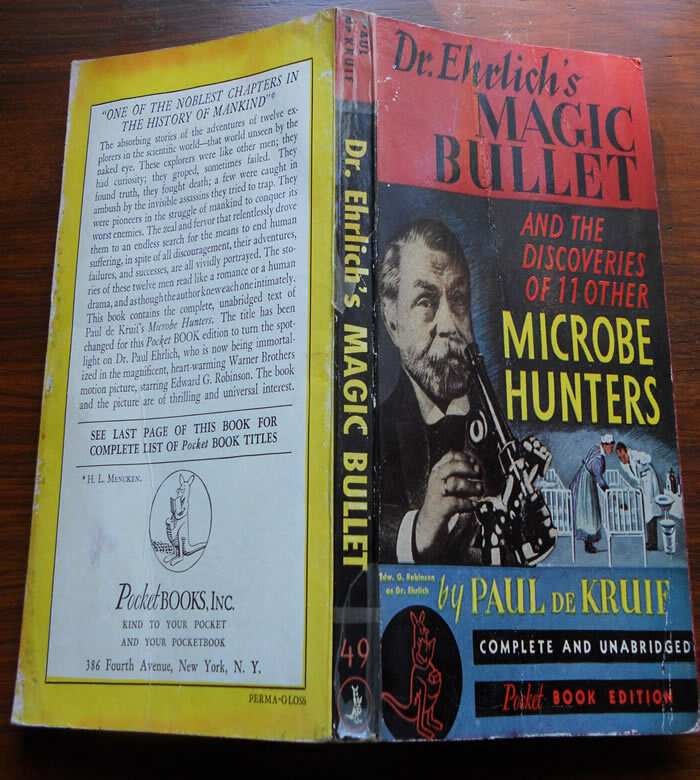 Here comes a tribute to bacteriologist Paul de Kruif (1890-1971), author of the acclaimed book Microbe Hunters published in 1926. The very thought of reading Microbe Hunters should not be discouraged, as it has been recently, solely because of Paul de Kruif's usage of archaic terminology. Many microbiologists have read Microbe Hunters and those who have not, should. It particularly focuses on the heroic battles against infection and describes the struggle and quest of those who dared fighting infectious diseases. As the lively stories for van Leeuwenhoek (1632-1723), Spallanzani (1729-1799), Pasteur (1822-1895), Koch (1843-1910), Roux (1853-1933), Behring (1854-1917), Metchnikoff (1845-1916), Theobald Smith (1859-1934), Bruce (1855-1931), Ross (1857-1932), Grassi (1854-1925), Walter Reed (1851-1902) and Paul Ehrlich (1854-1915) unfold, the reader is overwhelmed. Paul de Kruif not only tracks the scientific facts but the hunters’ character in a bold and straightforward way, with passion. He praises van Leeuwenhoek for his honesty: "He had a sound instinct about the infinite complicatedness of everything -that told him the danger of trying to pick out one cause from the tangled maze of causes which control life". One can feel his admiration for Spallanzani who had "the strange self-forgetting spirit of a few rare men, those curious men to whom truth is more dear than their own cherished whims and wishes". 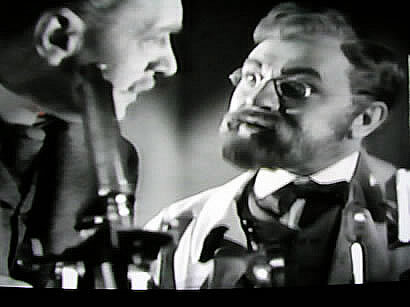 He is astonished by Pasteur: "But one of Pasteur’s most charming traits was his characteristic of a scientific Phoenix, who rose triumphantly from the ashes of his own mistakes". He marvels at Koch’s modesty: "…never…did he seem to realize that he was the leader in the most beautiful and one of the most thrilling battles of men against cruel nature". He overlooks the massacre of the guinea pigs by Roux and Behring because "…they were saviors - and that is noble! - but this drove them sometimes into strange byways far off the road were you find truth…". He is resentful towards Metchnikoff: "But the pitiful waste of this brainy Metchnikoff’s life was that he was always doing experiments to defend an idea, and not to find the hidden truths of nature". 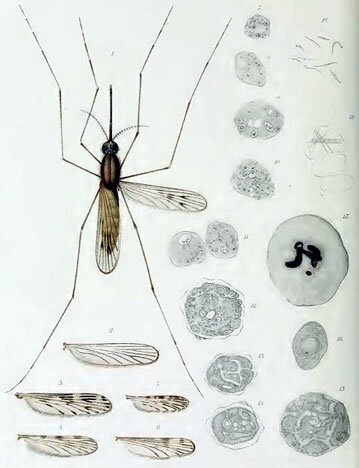 Figure is from L'immunité dans les maladies infectieusesGoogleBook (Immunity in infectious diseases) by Elie Metchnikoff, 1901. Figure represents microphage bursting due to growth of Vibrio metchnikovi in exudate from vaccinated guinea-pig. He shows respect for David Bruce: "There was something diabolical in the risks he took, and something yet more devilish in the way he could laugh -with a dry humor- and wish other microbe hunters might have died to prove some of his own theories. But he had a right to wish death for others". He is indignant at the Ross and Grassi scuffle: "To listen to these two, you would think each would rather this noble discovery had remained buried than have the other get a mite of credit for it". He has mercy for Walter Reed however his apparent praise conveys disapprobation: "…never was there a good man who thought of more hellish and dastardly tests!" From Walter Reed: a memoirGoogleBook by Walter Drew McCaw, 1904. Excerpt: Money and full authority to proceed were promptly granted, and to the everlasting glory of the American soldier, volunteers from the army offered themselves for experiment in plenty, and with the utmost fearlessness. He has sympathy for Paul Ehrlich: "…let us think of the good brave adventurer Paul Ehrlich was and the thousands he has saved". 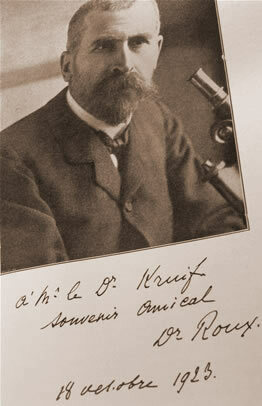 Triumph in chemotherapy: Ehrlich and Hata's discovery in 1910 of the arsenical drug '606' or Salvarson. Salvarson (that which saves by arsenic) had the most astonishing effect on syphilis which resulted in much more research on chemotherapeutic remedies. Formula is from The Conquest of Bacteria: From Salvarsan to Sulphapyridine by F. Sherwood Taylor, 1942. The reading of Microbe Hunters has triggered, among scientists of notoriety, both passion and dedication toward microbiology, and students and young researchers have found in it a never-ending source of inspiration. 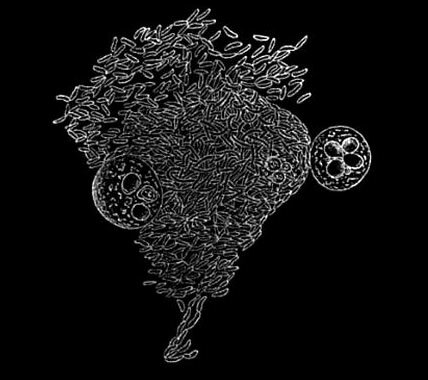 Let's now revive Paul de Kruif's own confession "…I love these microbe hunters…Not especially for the discovery they have made nor for the boons they have brought mankind. I love them for the men they are. I say they are, for in my memory every man jack of them lives and will survive until this brain must stop remembering". To read Paul de Kruif’s Microbe Hunters is to be steered towards remembrance of these men in an emotional and definitive way. And one must acknowledge the veracity in Paul de Kruif’s description of these pioneers’ human nature and their contribution to mankind. 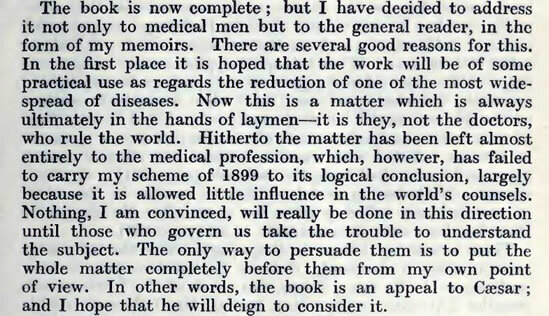 Excerpt: These observations, says Dr. [Theobald] Smith in his published report, forced upon me like a flash the conviction that we were here in the presence of a wholly new fact in the cause of disease. 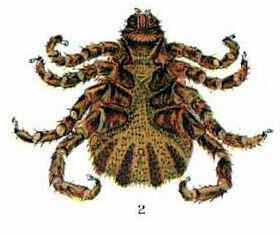 This was the introduction of the disease by inoculation. 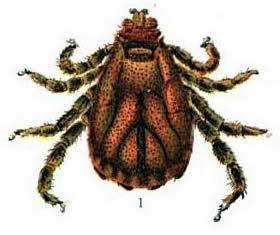 … The body of an insect … makes an unexceptionable culture tube. And its bill or beak makes an ideal hypodermic syringe. Emil von Behring: What do you mean affinity? Paul Ehrlich: The attraction certain atoms possess for certain other atoms causes them to unite and form compounds. Emil von Behring: Most extraordinary! Paul Ehrlich: Of course it all depends of discovering the special dye which has an affinity for the substance one wishes to stain. Emil von Behring: Specific staining! Great heavens, what about a microbe? Do you think it will be possible to stain a microbe and nothing else on the slide? Paul Ehrlich: It would be possible, I think. Note: Ehrlich introduced methylene blue, one of the most extensively used dye in bacteriological work. It was used by Koch to reveal the tubercle bacillus (Mycobacterium tuberculosis).